What Day Of The Week Was January 21? 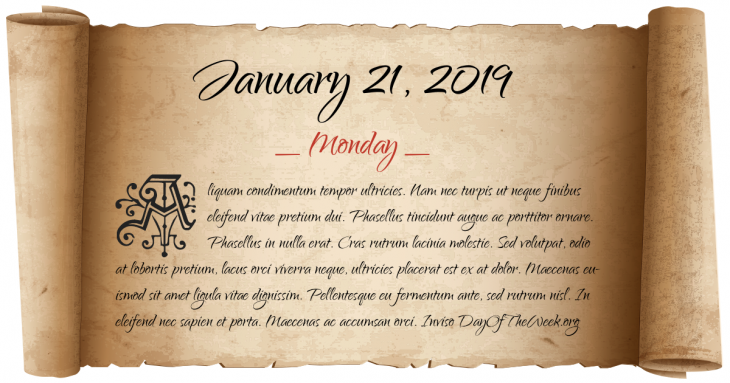 January 21, 2019 was the 21st day of the year 2019 in the Gregorian calendar. There were 344 days remaining until the end of the year. The day of the week was Monday. If you are trying to learn Japanese then this day of the week in Japanese is Getsuyōbi. Here’s the January calendar. You can also browse the full year monthly calendar. Aquarius is the zodiac sign of a person born on this day. Garnet is the modern birthstone for this month. Emerald is the mystical birthstone from Tibetan origin that dates back over a thousand years. The Swiss Anabaptist Movement is founded when Conrad Grebel, Felix Manz, George Blaurock, and about a dozen others baptize each other in the home of Manz’s mother in Zürich, breaking a thousand-year tradition of church-state union. The first American novel, The Power of Sympathy or the Triumph of Nature Founded in Truth, is printed in Boston, Massachusetts. After being found guilty of treason by the French Convention, Louis XVI of France is executed by guillotine. Sir Isaac Isaacs is sworn in as the first Australian-born Governor-General of Australia. New Year’s Day in Chinese calendar. Start of the year of the Fire Horse in Chinese astrology. Vietnam War: Battle of Khe Sanh – One of the most publicized and controversial battles of the war begins. The current Emley Moor transmitting station, the tallest free-standing structure in the United Kingdom, begins transmitting UHF broadcasts. Commercial service of Concorde begins with the London-Bahrain and Paris-Rio routes. Production of the iconic DeLorean DMC-12 sports car begins in Dunmurry, Northern Ireland. In Belmopan, Belize, the unrest over the government’s new taxes erupts into riots. Who were born on January 21?